Join us live each week at www.productivity.academy/live and get your questions answered by submitting them at anytime right here: www.productivity.academy/questions. You can watch the video for the past episode recorded on August 9th, 2018 above, or you can review the transcript below. 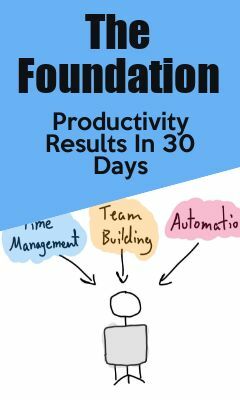 What is the best way to manage projects and employees with software or automation? Is there a best fit tool out there to help with this and reporting for projects and clients? How to break down big projects into smaller chunks. Is it important to understand why I was unproductive in order to be productive? All right. Welcome to the Productivity Academy Live Q&A, episode number 47, the one where Adam’s wearing some weird glasses, but we’ll get to that in just a second. Today we’re going to be going over a few questions. We’ve got some really good ones about software and systems to automate and manage work reporting CRM, both for clients and employees. Also how you can go about breaking down your projects and goals into smaller, manageable chunks. We’ll talk a little bit more about that for sure. Then a good question that came across: Is it important to understand why I was unproductive in order to be productive? Great questions lined up today and then if anything comes in live, we’ll tackle that as we go. First real quick, I want to say first of all if you’re watching live, thanks for watching and if you’re in the group, that’s great. Go ahead and pop in your questions as we go. If you’re watching the replay on YouTube, you can click subscribe and subscribe to the YouTube channel or, alternatively, you can come join us in the Real World Productivity Growth Group in the link that’s also below. You just need to click on that, answer the few questions because we want to make sure you actually want to be there. They’re simple stuff like how did you find it, are you interested in organization and productivity and then come join us. You can catch these live as well as interact with other people who are also interested in productivity. As to the weird glasses, I’m giving these a shot. It’s obviously the tinted glasses to block out the wavelengths of the bluer light, without going into details. I’m going to give these a shot. I’ve seen people wearing these, especially people that spend a lot of time on the computer and as someone who also does that, my first solution is don’t spend so much time on the computer. However, at times that isn’t an option, so I’m going to see if these help as well as wearing them a little bit in the evening. For now, I’m going to take them off since for me, it’s 11:00 AM and I don’t really need those. I thought they looked kind of cool. A little weird, though. All right, let’s get into the first question. Lets’ see. We had one of the members asking, trying to find a good system or software to automate and manage my work reporting, project management, CRM work processes, both for client work and managing employees. Okay, so I think that there’s definitely two different things there and you’ve mentioned that. You’re looking for a way to manage the work reporting, project management, CRM. I would break those down. I haven’t come across one system that does everything well. I think that the way you’re going to get the most benefit is to break this down into each area. I might say work reporting and project management, you might be able to squish that together, but then CRM for your customer relationships or for managing your clients or customers, I would then have that somewhere else. I think it’s possible to do this in one if you put this together yourself, but there’s a lot of tools out there that are really made for CRM, whether you’re using a big tool like Salesforce, Salesflare. There’s so many out there. I would do whatever works for you. Try one. If you don’t have one, just get started on that. I’m going to focus more on the project management and work reporting side and say that if you don’t have one, then obviously, you need to get started. I think the best one to start with is Trello because you can set that up and it can be as complicated or as simple as you want. By that, I mean you can lay out the work for your clients in Trello and you can manage your employees there. You could create checklists. You can use that in conjunction with Google Docs to create working documents. For example, let’s say you assign a card of setup website, literally for Client X. Then you say that and you include a link into the doc that has that working procedure or maybe what the steps are for building out a website. I realize that’s very simplified, but that’s kind of the idea. Then you can make this more complicated as you go. That’s the basic idea. For myself, I use a lot of Trello boards where we’ll have how to use it as one list and then like for content generation, a list of ideas or things to choose from and then assigned, so someone gets notified when it’s moved into there. Then they have a done or for review, and then a completed and finished. At each step, there can be notifications, whether that’s done in Trello or done by third party like Zapier. When a card is added, it sends a notification maybe to Slack or email or whatever you want to do. The other thing I would think about looking at is something like Monday. It used to be the Pulse. I personally use this. You can try using this and this might give you a little bit more flexibility on the time estimates. Instead of using cards, it’s more of a task list type of idea, but you can add a lot of rows or columns on there, things like time estimate, uncertain claimables. You can do like a Gantt chart. There’s a lot of flexibility with that. I think, as with anything, it comes down to defining what it is you need to do and what do you do regularly and then build the system behind that. If you’re doing client work and managing employees, you put that into one and put together your processes behind that. What is it you’re doing? How long should it be taking people to do this and getting those process documents going so that you no longer have to explain it. Maybe you walk through the process once or twice and record it. Then you can hand that off. Again, that can be linked in a Google Doc. It can be a Trello card about how to do this task, anything that works like that. I think that that’s a good thing to do and the other upside of this is if you start doing this, then you can manage how long it takes your employees and then you can start automating and managing the reporting. That depends on what you want to report. Is it that the task was completed? You can start getting things done where, when the employee moves, let’s say, the Trello card from one list where he’s working on it to another and says it’s done, that you could trigger a review for you and then you’re able to send the client a notification or you an automate that entire process. I think that that’s a good step. If there is something specific about that, I think that would be fun to dive into. All right, let’s see. The next question is breaking down big projects into smaller chunks. Basically, how to take something large … The classic example is I want to lose weight and that’s not a great goal to have in the sense that it’s not specific, it’s not measurable, it’s not time bound, so kind of doing the same thing with anything. I think that I’ll use the smart goals as a really good example if you have a hard time breaking down these really large projects, is to keep your large project, or maybe the goal of the project but then ask yourself, okay, what are the three milestones? Okay? I just picked three. It’s arbitrary somewhat. Anything between two and five. You don’t want to have a bazillion milestones, so let’s stay with the three. You fill those out. Maybe for losing weight, you’re going to say I need to lose one pound in the next ten days and then I’m going to run two miles three times a week and I’m going to drink four glasses of water before noon every single day. This is a pretty simplistic example. Those could be your milestones. In this case, those are basically going to be your action items, too, but you could break down how you’re going to make each one of those happen. Losing the one pound might have three action items behind it like eating a banana or a piece of fruit for breakfast everyday, things like that. I think that it’s important to keep the SMART acronym in mind, and I jumble this up whenever I say it, but specific, measurable, achievable/attainable, realistic and then time-bound. If you do those things, that’s really going to help you with any project. It doesn’t just have to be something like a life goal. It could be work projects, again maybe something like delivering a website to a client. That’s a big goal, right? There’s a ton of steps and a lot of things that go into it. You can then break it down into the milestones of maybe developing the framework like drawing out in a spreadsheet what the structure of the website looks like. It could be identifying all the graphical elements needed and then identifying all the written content needed. Those are three huge areas and I’m leaving out things like hosting, but looking at the main areas and then breaking those down. Well, in order to get all the graphical areas, what three things do you need to do? You just keep iterating through that process. Hopefully, that is helpful. I find that that is a great way to break down big projects into smaller chunks. Okay, last question lined up for today is: Is it important to understand why I was unproductive in order to be productive? I think that the answer to me is yes and the reason is this. Part of getting the biggest gains out of being productive is realizing where you’re being productive. For example, what I mean is once a week I sit down and I look back and I say where have I gotten the most gains in general, but also just in terms of productivity and making forward progress on projects. Now the reason I do that is because I want to spend that time and multiply the benefits. If you just keep going, that’s fine. You’re productive but you want to look at say okay, is there something specific that I’m doing that’s better and providing better results than some of the other things that I’m doing. That’s just natural. How can I do more of that or how can I get more results? The flip side of that is you can spend some of that time and say, “What is it I’m doing that’s not giving me results or that’s giving me bad results or it’s detracting or taking time or revenue or resources away from me?” That is just as important. I think a lot of people don’t spend the time reflecting on this, either on the positive or the negative, and I think it’s just two sides of the same coin. I would say, yes, understanding why your unproductive will help you be more productive. I don’t think that you need to solely focus on that and you might not need to understand the root cause right away, but I do advise reflecting back and saying what maybe didn’t give me the results or what have I been spending time on that maybe wasn’t giving me the best results and saying how can I cut that out. Is it something that I still have to do? Can I delegate it? Can I do it not as often? Can I automate it? Something like that. Hopefully, that helps and I don’t see any additional questions, so I think that will do it for episode 47. Like I said, if you want to join live, you can join the Real World Productivity Growth Group by clicking below. If you’re watching the replay, you can feel free to subscribe on YouTube and you’ll just be up to date when there’s new episodes released as well as reviews and any sort of tips and tactics and anything to do with productivity, time management, organization, app reviews, all of that good stuff. Thanks for watching and we’ll catch you next time.